Pada postingan kali ini admin bagikan soal dan jawaban bahasa inggris kelas 10 kurikulum 2013 sebagai referensi ulangan UTS/PTS, UAS, UKK dan juga latihan UN SMA/ SMK Tahun pelajaran 2018/2019. Soal dalam bentuk pilihan ganda, bisa dikerjakan secara online maupun offline. Mengapa admin membagikan soal bahasa inggris kelas 10 ini kepada anda? tentu saja agar peserta didik bisa belajar secara mandiri dengan rekomendasi dari guru mata pelajaran tentunya. Pertama, berikut kami petikkan soal-soal bahasa inggris sma kelas 10 kurikulum 2013 terbaru dalam bentuk pilihan ganda dan essay yang diambil dari buku k13 revisi 2017. Selamat mengerjakan! 1. new – that – Japanese – belongs – car – to – director – the – black – expensive What is the correct arragement of the words above? 2. The following sentences are responses of congratulation, except…. Lisa : “I have jus told by Eric via SMS that you had passed the National Examination. 6. My sister… (1) to cook. … (2) always has brilliant ideas for my lunch every day. … (3) cooks oxtail soup for today. I invite my freinds to our house to taste this soup. … (4) love it so much and tell … (5) sister to open a restaurant because they think many people will like this soup and she will make much money from …(6). This text is for question 3 – 4 Good morning, I am Lucky, Lucky Wijaya. My father is Javanese and my mother is Sundanese. I just moved here. And now, I study in this school. Thank you. I arrived at school on time. The teacher asked us to hand in our homework. My homework was not in my bag. I had forgotten to put it in my bag the night before. I usually check my bag in the morning. I did not do this because I was late I had to do extra assignment as a punishment. After Biology lesson, I did not tie my shoelace properly. I tripped over it. And fell down the stairs. I hurt my knee and had to have a bandage on it. What a terrible day! I hope that I have much better one tomorrow. 7. What is the purpose of the text? 9. What made everything went wrong? 10. Which of the following statement is NOT TRUE according to the text? 12. Jaka : Mom ! I have a good news ! Mom : What is it dear ? Jaka : My English teacher told me that I got excellent score in the last test ! Mom : Really? Oh, ………………. ! 13. Vitane : Hi, Jessica, oh Gosh! What happens to your finger? Jessica : Hi, Vitane, well I unintentionally hurt my finger. Vitae : How did it happen? Jessica : I peeled an apple and knife ,you know! Vitane : I see. Jessica look! It keeps bleeding _________. Beny : I am deeply sorry to hear that .Why didn’t you tell me before ? Father : What’s wrong with you, son? Endy : I fell from the motorcycle when going to grandma's house. Father : ____________, put the medicine on it. 16. Hamid : John, I’m so bored hearing Mr. Brown speech. Faiz : Why do you say so? Hamid : His speech is too long. 18. A : Hi Jhon How do you do? B : ………..
19. Hamid : ……………..? Ahmad : I’m 15 years old. b. What is your old? c. How many age are you? 20. Jhon writes a letter to his father. Past Tense of the sentence above is…. Last summer, I went to Italy. I visited museums and sat in public gardens. A friendly waiter taught me a few words of Italian. Then he lent me a book. I read a few lines, but I did not understand a word. Everyday I thought about postcards. My holidays passed quickly, but I did not send any cards to my friends. On the last day I made a big decision. I got up early and bought thirty-seven cards. I spent the whole day in my room but I did not write a single card. 1. Answer the following questions based on the text clearly! a. What is the type of the text? b. Where the writer sit when he visited museum? 2. Change words in the bracket ( ) into past (V.2) form! b. Faiz bukan seorang dokter. Demikian soal bahasa inggris SMA/smk kelas 10 Semester 1 & 2 Kurikulum 2013 dan ktsp yang bisa kami bagikan. Semoga bermanfaat. 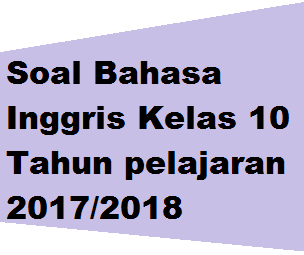 0 Response to "Soal Bahasa Inggris Kelas 10 Semester 1 & 2 Kurikulum 2013 terbaru "